Not only is the idea of overpopulation as the cause of the environmental crisis oversimplified and inaccurate, it upholds a de-generative paradigm of scarcity, fear and competition that goes against the core teachings of permaculture. It also perpetuates problematic thinking that leads to ineffective and unjust public policies and global solutions. As permaculturalists, it is important that we contradict this notion that simply more people on the planet equals less resources and more pollution. We need to engage in dialog around the true roots of environmental, social and economic degradation. In this way, we can begin to shift mental models and design more effective and just solutions that take into account the real root causes of degradation and injustice. 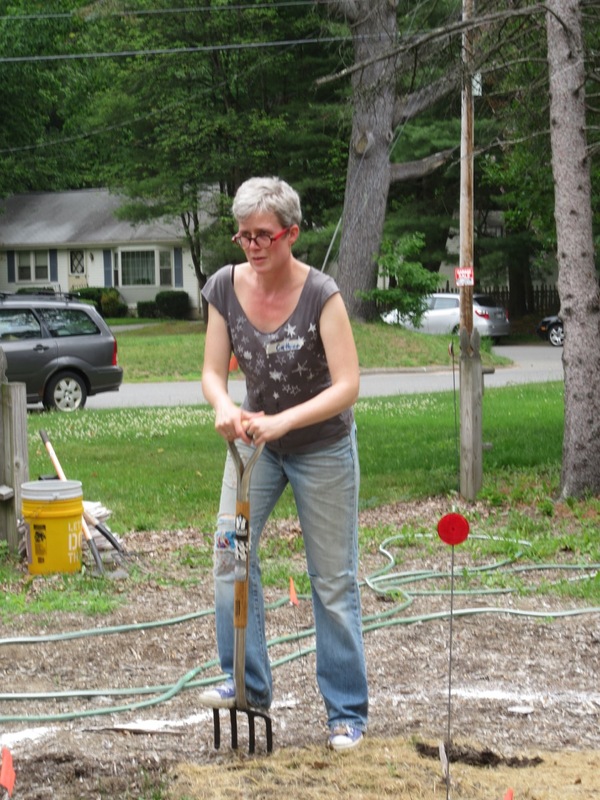 Lisa DePiano is a certified permaculture designer, teacher and practitioner with over 15 years of experience. She is a lecturer in Sustainable Agriculture at the University of Massachusetts and a research fellow at the MIT media lab. She runs the Mobile Design Labwhich specializes in participatory permaculture design and education and is author of Permaculture FEAST principles flash cards. A few nights ago, a lucky group of us got to spend the evening with herbalist Mischa Schuler talking about all of the medicinal plants in the mint family. Who knew the mint family had so many plant allies? Of course most of us know about peppermint, which is obviously a mint, but what about wood betony and bergamot? Did you know that rosemary and lavender are mints? Opening her talk with an image from the book “Botany in a Day”, (which is a favorite of mine and Mischa also strongly recommends!) we learned some key identifying features for these plants. Square stems, opposite leaves, “mint” flowers (5 fused petals), and an aromatic smell will just about guarantee your plant is in the mint family. Mints can support multiple body systems including our digestive, musculoskeletal, respiratory, and nervous systems. What is amazing to me is the subtleties of working with these plants. For example, Mischa describes a nervine stimulant as a plant that will be both soothing on the nervous system but also keep us alert. Peppermint has a cooling effect in that it dilates blood vessels, bringing them closer to the surface of the skin and release heat — but only if you drink it hot. Wood betony can be used to bolster self-confidence, while skullcap is useful for letting go of other’s opinions about us. Mischa brought dried plant material to pass around and tinctures for us to taste. The highlight of the evening was the sharing of lemon balm tea. Together, we made a brew of the dried leaves and allowed them to steep while we continued a conversation about the benefits of this incredible plant. We then sipped it together, taking a long moment of silence to really feel into the experience. I was struck by how alive the tea felt in my body, like it was traveling from my tongue to my belly to all the peripheral places, fingers and toes. In early March, when the snow is still on the ground and it feels as though spring may never come, this aliveness is a welcome sensation. Mischa has a way of bringing the spirit of the plants to the foreground. Her knowledge shines through in a totally unpretentious way – she so obviously loves what she does and does it for the right reasons. If you are at all interested in how plants can be used as medicine, I highly recommend signing up for her Beginner Herbalism Garden Series. This series will take place over 4 weeks in May in Mischa’s yurt, as the plants begin to emerge from their winter slumber. Learn more or sign up here! Over 20 people came to our yard and worked together on projects organized by the Resilience Hub. 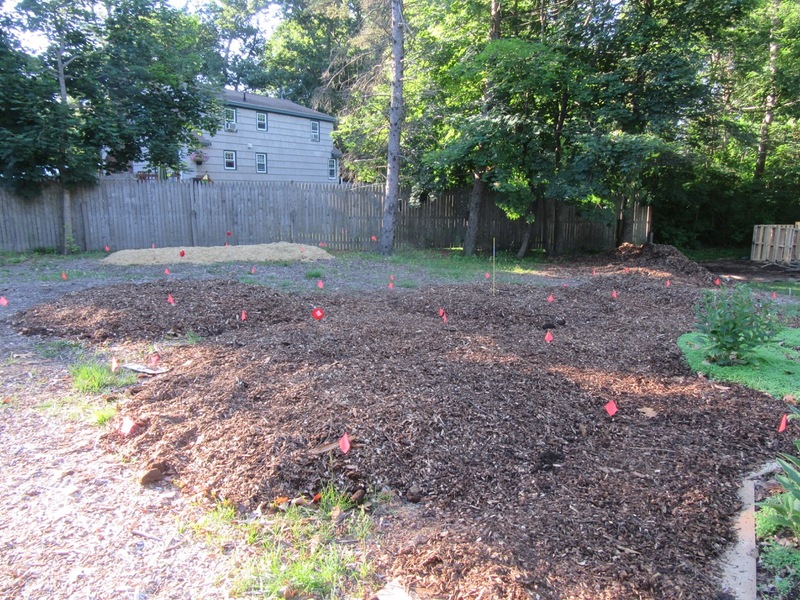 They installed rain barrels, built a composting system from pallets, built a fire circle, and created five more growing beds for future fruit trees, raspberry bushes, & hazelnut bushes, and one bed for flowers & herbs. We also got the first shovelfulls dug for a pond. At the end of the day, I felt teary-eyed with the sense of Gift. The generosity of so many individuals coming together and creating something so beautiful and full, helping us to realize our dreams for this piece of land, was deeply moving. There is something about this giving and receiving of human attention and wisdom and care, that feeds our hearts. Much of our lives are shaped by transactions—we pay a certain amount of money, and receive a product. Or, we put in so many hours and receive a paycheck. But giving and receiving freely and generously touches something much deeper. Giving and receiving must trigger deep neurotransmitters in our internal chemistry, sparking a profound sense of well-being and belonging. Another layer is the community of the soil itself. During the blitz I was mostly working with several others on the project for creating new growing beds. 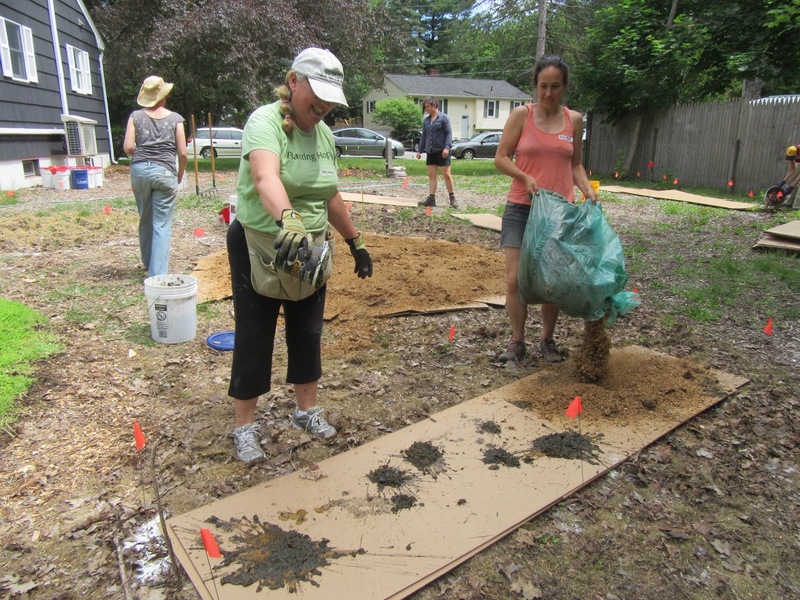 We were adding nutrients through sheet mulching so that the soil could create a thriving fertile community. I have learned so much about the variations in soil communities from the book The Holistic Orchard by Michael Phillips. We also made several pathways with cardboard and wood chips, and I worked to complete those bit by bit in the days after the blitz. Wonderfully, the process then works on its own–we add some water or it gets rained on–and the microbes will work together over the next several months and years to create a thriving soil community. We planted trees and bushes the following spring. My friend Roger Paul said that the Wabanaki word for “soil” means giver of life. I encourage you to consider participating in a Permablitz to experience this sense of community for yourself!